Your vehicle includes a variety of electronic features that can be personalized to your preferences. The settings of these features can be changed by the meter control switches, on the audio system screen or at your toyota dealer. Touch �vehicle� on the �setup� screen. Touch �setup� on the �apps� screen and select �vehicle�. 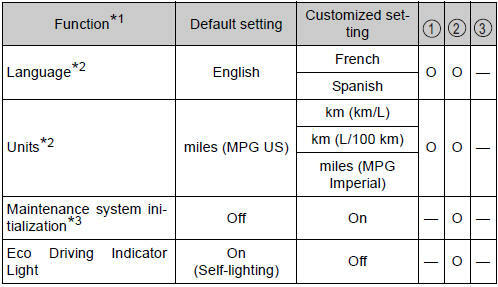 Various setting can be changed. Refer to the list of settings that can be changed for details. 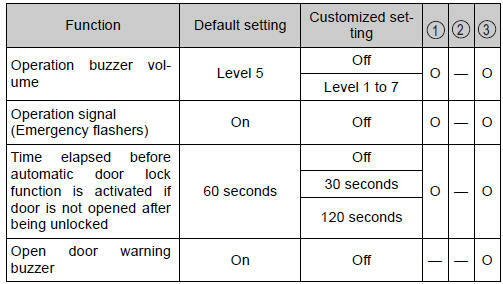 Some function settings are changed simultaneously with other functions being customized. Contact your toyota dealer for further details. *1: For details about each function: *2: The default setting varies according to country. *4: some status screens cannot be registered (indicated on multi-information display). 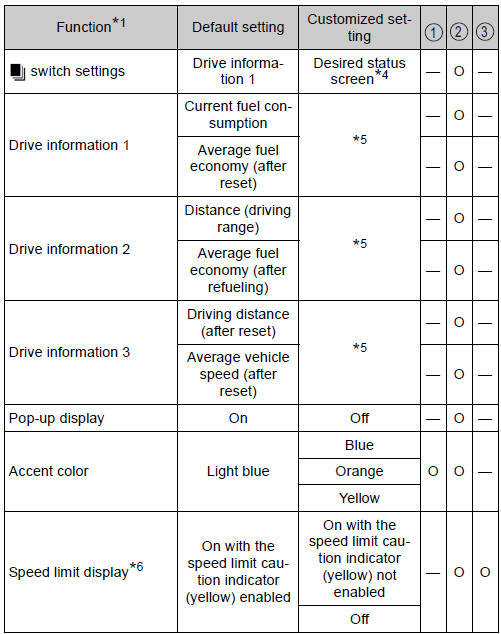 *5: 6 Of the following items: current fuel consumption, average fuel economy (after reset), average fuel economy (after refuel), average fuel economy (after start), average vehicle speed (after reset), average vehicle speed (after start), distance (driving range), elapsed time (after reset), elapsed time (after start), distance (after start), driving distance (after reset), blank. *6: Speed limit display may not be available for some regions. 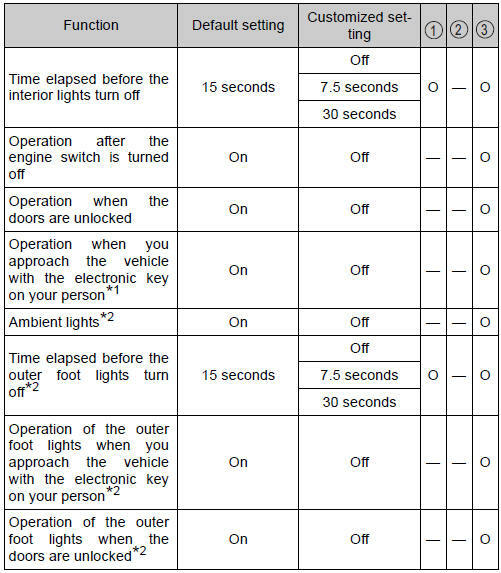 *1: After flashing the turn signal lights when turning left or right while this function is off and the turn signal lever is moved to the first position in the direction of the flashing light, the turn signal lights can be selected to be flashing or off. *2: The turn signal lights will be off if the turn signal lever is moved to the first position in the direction of flashing light. *2: when intuitive parking assist is operating. 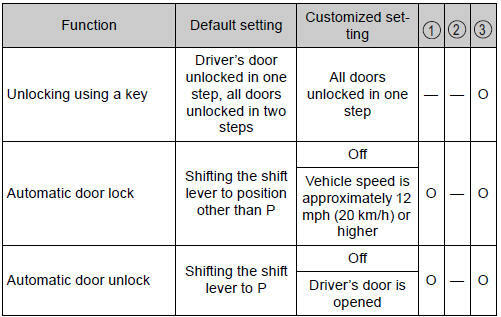 When the smart key system is off, the entry unlock function cannot be customized. When the doors remain closed after unlocking the doors and the timer activated automatic door lock function activates, signals will be generated in accordance with the operation buzzer volume and operational signal (emergency flashers) function settings. The opening angle setting can be changed through operation of either the power back door switch or the audio system screen. 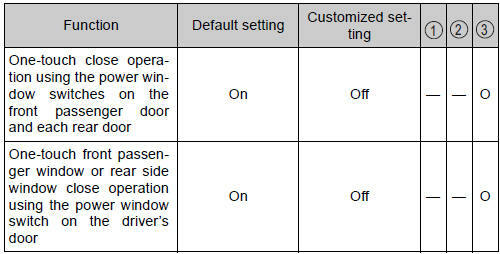 However, if the engine switch is on and the power back door switch is used to change the opening angle setting, the changed opening angle will not be reflected on the audio system screen until the engine switch is turned off and then on again. Stop the vehicle in a safe place, apply the parking brake, and shift the shift lever to p. Also, to prevent battery discharge, leave the engine running while customizing the features. As the engine needs to be running during customization, ensure that the vehicle is parked in a place with adequate ventilation. In a closed area such as a garage, exhaust gases including harmful carbon monoxide (co) may collect and enter the vehicle. This may lead to death or a serious health hazard. To prevent battery discharge, ensure that the engine is running while customizing features.